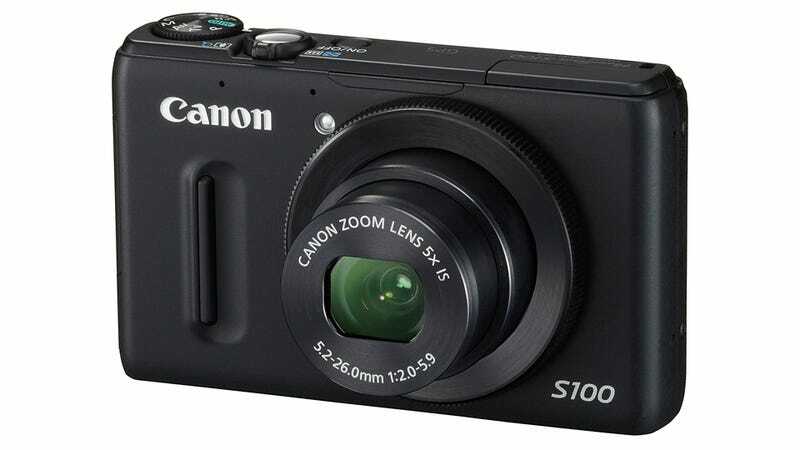 Canon's S95 was our favorite pocket camera. Um, it's probably not anymore. Meet the S100. What's new? Oh, Canon's first Digic V processor. A wider 24mm zoom lens. A 12-megapixel CMOS sensor (up from a 10MP CCD). 1080p video. And GPS built-in. The Digic V processor is a lot of the magic here: It's why the S100 can pull out 1080p video (@24fps) and shoot 10 frames a second. Canon is bumping the megapixelage slightly from the S90/S95, to 12 megapixels, but maybe more importantly it's also switching from a CCD sensor to a CMOS chip. (An old, but valid primer on CCD vs. CMOS.) The Digic V image processor is also gonna kick in more advanced noise reduction (ISO now goes up to 6400), along with smarter auto-white balance (which I'll believe when I see). Oh! And there's a new mode: High-speed burst, which captures up to eight frames simultaneously, so you don't miss a critical shot of someone getting beaned in the face. The new lens is wider and zoomier, starting at 24mm with a 5x zoom, going to 120mm (vs. the 28mm 3.8x zoom of the S90/S95). It's just as fast though, starting at F2. Lastly, it's got some built-in GPS powers, like a logger. Missing? The stark, simple beauty of the S95. The S100 might be more ergonomic. But I'd rather look at my old, nicked and scuffed S90. Oh well. Everything you loved, like RAW shooting, is still there. It'll be $430 when it drops soonish in November.